1945 – Japan surrenders unconditionally to end WW II on Victory over Japan Day (V-J Day). 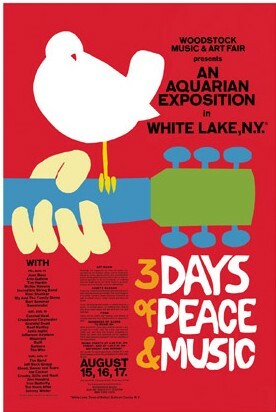 1969 – The Woodstock Music and Art Fair opens on Friday, August 15 at Max Yasgur’s Dairy Farm in upstate New York. 450,000 people met to watch two-dozen bands play music for 3 straight days. 1939 – The Wizard of Oz premieres at Grauman’s Chinese Theater, Hollywood. 1948 – Candid Camera, with Allen Funt, debuts on ABC TV. 1948 – CBS-TV broadcasts the first nightly news show with Douglas Edwards as anchorman. 1964 – The Beatles’ A Hard Days Night opens in New York City. 1981 – The Waltons last broadcast airs on CBS-TV. 1952 – Willie Mae Thornton (Big Mama) records the original version of “Hound Dog”. 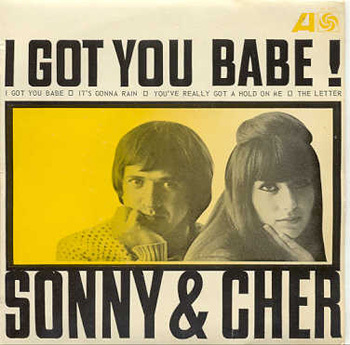 Elvis Presley would bring the song to superstardom 4 years later. 1958 – Elvis Presley’s single “Hard Headed Woman” goes gold. 1966 – The Beatles play their final tour show in the US at Candlestick Park in San Francisco. 1967 – Fleetwood Mac makes their stage debut at the National Blues and Jazz Festival in Great Britain. 1974 – The Ramones concert debuts at New York City’s CBGBs. 1981 – “Endless Love”, by Diana Ross and Lionel Richie, hits #1 and stays there for 9 weeks. 1985 – Madonna’s album, Like A Virgin, sells five million copies, making it the first solo album by a female artist to hit such status. 1987 – A Chorus Line celebrates its 5,000th performance. 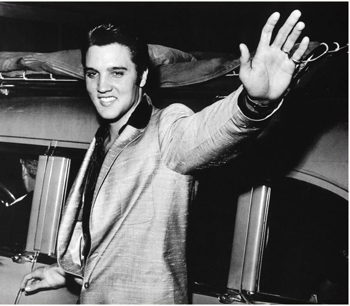 1977 – Elvis Presley dies on August 16th, leaving his family and millions of fans devastated. 1985 – Madonna weds Sean Penn. 1935 – Babe Ruth plays his final game at Fenway Park – 41,766 fans pack the place to see him. 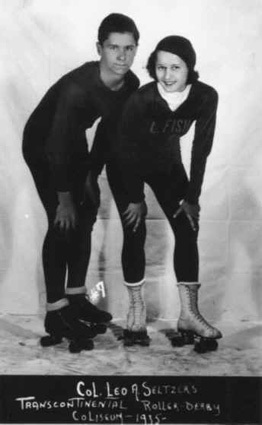 1935 – The first trans-continental roller derby match takes place at the Coliseum in Chicago, IL – 25 teams skate 3,000 miles. It takes the winning team, Clarice Martin and Bernie McKay, over a month of grueling, 11 ½ hour days to finish the derby on September 22. The first trans-continental roller derby - Chicago, IL - 25 teams skate 3,000 miles. 1948 – Babe Ruth, Baseball legend (NY Yankees), dies in NY at age 53. 1951 – The first baseball game in-color broadcast (Braves vs Dodgers) airs on WCBS-NYC. 1954 – The first issue of Sports Illustrated reaches newsstands. 1970 – Patricia Palinkas becomes the first woman to play in a professional football league game, holding the ball for the placement kickers of the Orlando Panthers. 1953 – The Wiffle Ball is invented by David Mullany and his son. They had been trying to invent a ball that would curve at every throw. 1981 – International Business Machines (IBM) introduces the personal computer Model 5150 PC with PC-DOS version 1.0, retailing at $1,565.00. The PC gains popularity and IBM soon takes the #1 slot, pushing Apple to #2. 1954 – Workers at the Studebaker automotive factory agree to pay cuts of $12 – $20 a week to try and help the company to stay afloat. 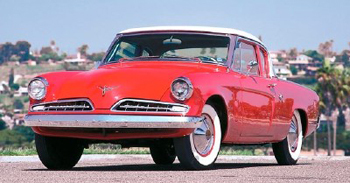 Ford, Chrysler and General Motors eventually drive Studebaker out of business.